The pathway winding its way up the Donkin Reserve from the back of the Opera House to the Great Flag wasn't just made like this by accident. The winding path represents a 1994 election queue winding its way towards the election box. An addition to the Election Queue path is over 3000 crosses left by youth of the city during the official opening of Route 67 and representing future votes in a democratic South Africa. This is the Election Queue as seen from the top of the Donkin Lighthouse. The last couple of months have been a bit on the dry side and after the previous weekend's rain it seems that the weather has suddenly discovered some more moisture to share with us. 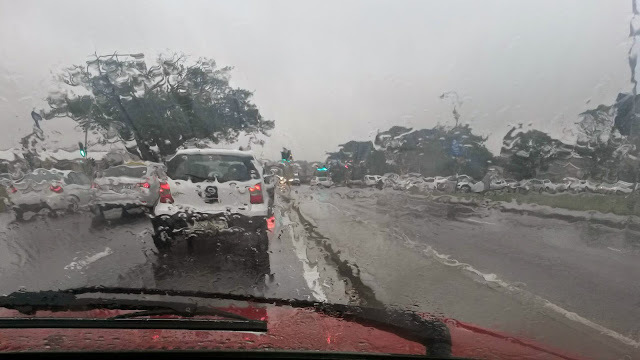 Over the last 48 hours we've had some good rains in and around Port Elizabeth with apparently more to come in the next day or so. I know its not the most exciting picture but here is one I snapped while sitting in wet traffic this morning. Wet traffic being the type where people forget how to drive, either going like hooligans or driving like grannies (no offense to grannies) and a normal 20 minute drive to work this morning took me an hour. Some people just know CJ Langenhoven Drive as the road that goes beneath The Bridge Shopping Centre, but its also the road that links Newton Park down towards the Korsten and North End area, becoming Kempstone Road at the bottom by Mercantile Hospital. A caching expedition over the weekend took us to a church just behind Greenacres and this view along with it. A view looking down Langenhoven. We don't often get to go out to coffee shops on a Saturday morning but today was different. 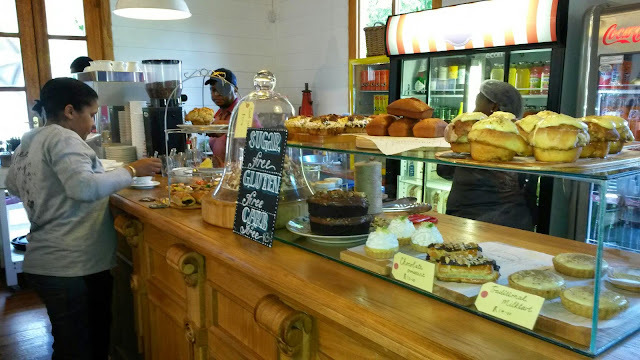 The Damselfly suggested that we stop for coffee at Brioche in Main Road, Walmer and we weren't sorry that we did. Arriving at the door we found the place "packed to the bleachers" but the staff was friendly and welcoming and we took a seat out on the stoep until a table became available inside. While we waited I decided to take a walk around to take a picture or two and it wasn't hard to see why they were so full. The cakes, tarts and breads on the counters looked out of this world. Once we were seated inside we had a better look at all the breakfasts passing us to other tables and every plate looked mouth watering. By the time we left Brioche had dethroned our previous favorite coffee shop and I'm sure it won't be long before we return. Next time our diet will be over and it won't just be the KidZ tucking into breakfast. Last Sunday it was time for runners to tackle the city in the annual Urban Run again. After participating the last two years I missed this one but will definitively be back next year. Check out this video by the organisers and see for yourself how much fun this event really is. 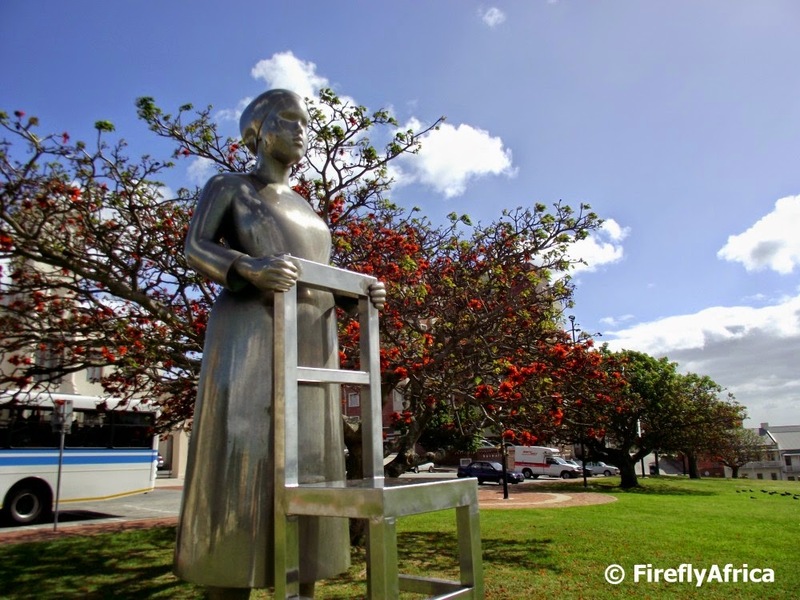 One of the art pieces installed on the Donkin Reserve as part of Route 67 is a woman standing behind a chair. It’s become quite a popular piece with visitors climbing onto the chair for a photograph with this strange looking woman. But why do I say strange? This untitled sculpture by Anton Momberg takes the form of a female figure without any distinct features and clothing. This leaves her neutral and open for conversation and interpretation rather than being a conceptionally specific piece. To me it also represents the women of Nelson Mandela Bay right from the early Khoi women who mined salt at Bethelsdorp, the Settler women who arrived on ships with their families in 1820 and Xhosa women who's men fought in the Frontier Wars to modern business women, domestic workers in the kitchens, mothers, sisters and daughters. The 24th of September is National Heritage Day in South Africa and all the different cultures like to braai in one way or another. 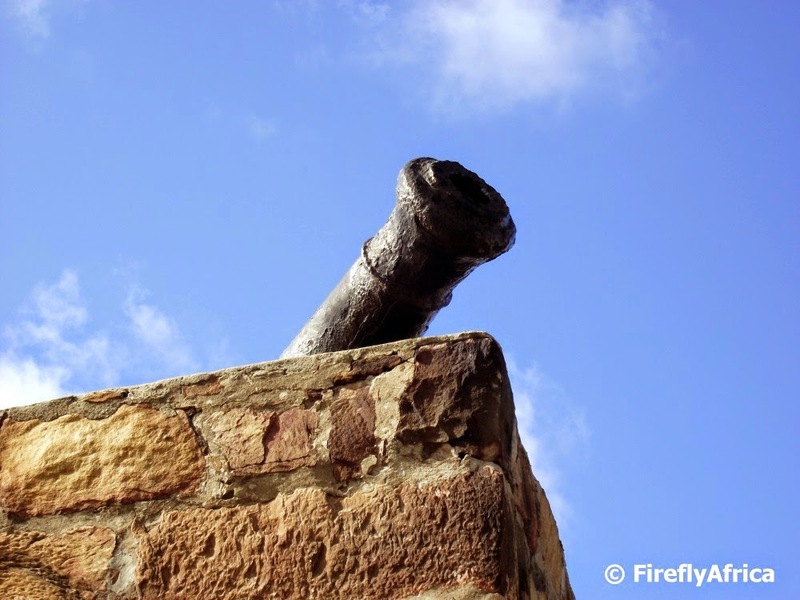 Somebody latched onto that and National Braai Day was born on the same day. This morning I joined my fellow Geocachers on a fun day out at the Van Stadens Wildflower Reserve for a Geocaching Amazing Race followed by a braai. Unfortunately the weather didn't play along and it rained the whole morning meaning that even though we had a fantastic event most of us were also soaked to the bone. We decided to head home to a warm bath and a bit of an afternoon nap after the race and had our braai at home. 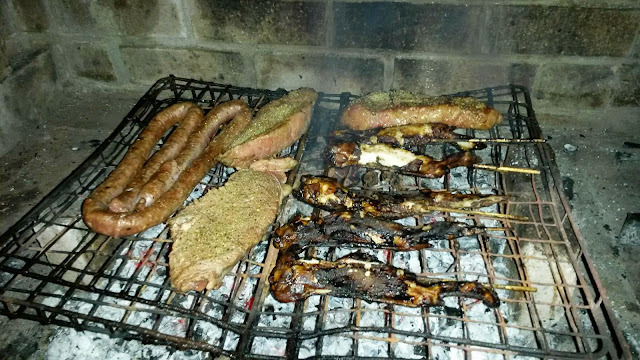 Happy Heritage and Braai Day. 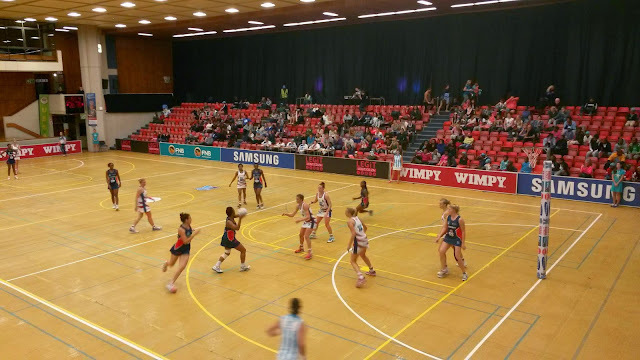 Last night we headed down to the Nelson Mandela Metropolitan University Indoor Sport Centre for the last day of three days of Varsity Cup Netball. Wow, it really is a spectacle to watch. Fast and furious. Pity it was so badly promoted which lead to a bad turnout, but those who did come was treated to top notch netball. 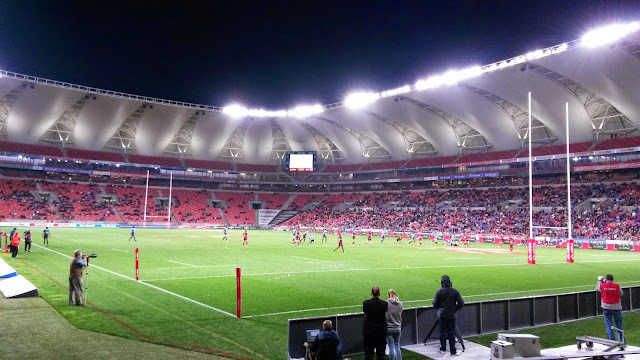 Here NMMU Madibaz in blue is playing Tuks in white. One of my absolute favorite historic buildings is the old Public Library across the road from the City Hall and Market Square. 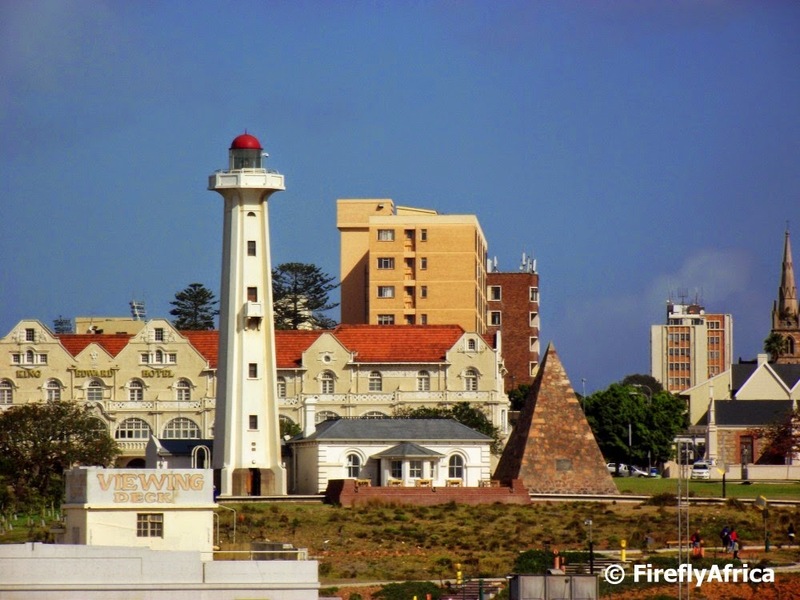 The building was built in 1901 with the façade constructed in England and shipped to Port Elizabeth in numbered blocks to be reassembled in front of the building. The statue of Queen Victoria was added in 1903 and completed the picture very nicely. A Geocaching outing last weekend yielded more than just a cache container. 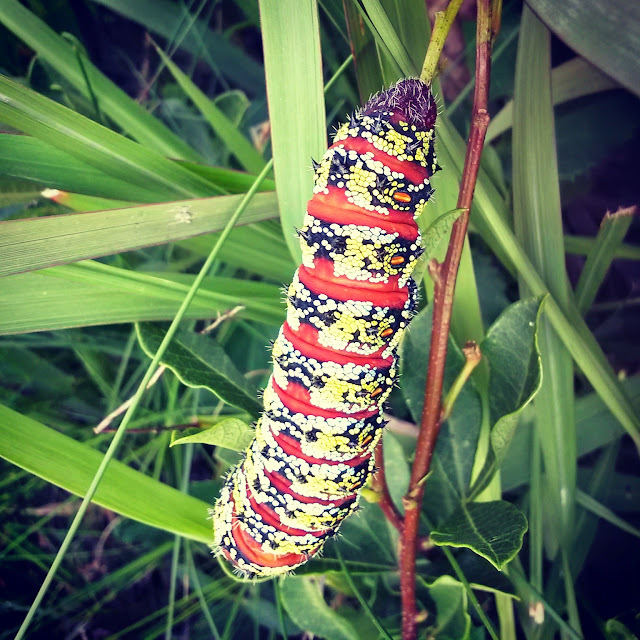 It also resulted in an inspection and photo session of what turned out to be Pine Tree Emperor Moth larvae or commonly known as a Christmas Caterpillar. This guy is probably the size of my index finger so I really wouldn''t want them getting into my garden. In case you wondered where we saw it. 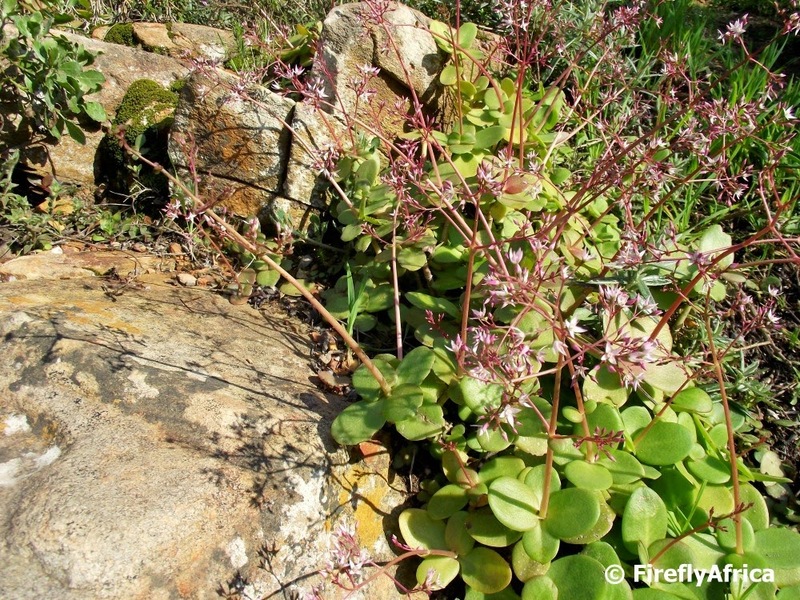 This one was somewhere along the Sardinia Bay road although I've also seen them on the Fynbos Trail at Schoenies. The Campanile's carillon of 23 bells is the biggest collection of bells in one tower in South Africa. As one climbs the 203 steps to get to the top you pass the room where the clock's mechanism is in and you can see the clockwork that allows the clocks to play its tune. Libby Sharwood of SAMREC once asked me if I have ever seen anybody look sad while watching a penguin. One just can't help smiling around them and I though this video by Mauricio Oliveira that I discovered on YouTube is very appropriate to that and ideal for this week's Friday video. 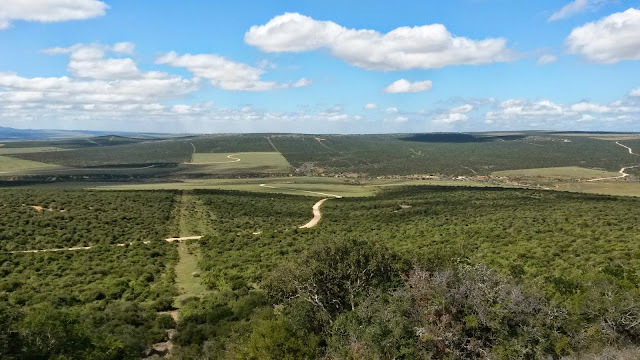 One of the best view sites in the Addo Elephant National Park is from the top of Zuurkop. Its one of the spots in the park where one is allowed to get out of your car although you still need to be vigilant as its no a fenced area. 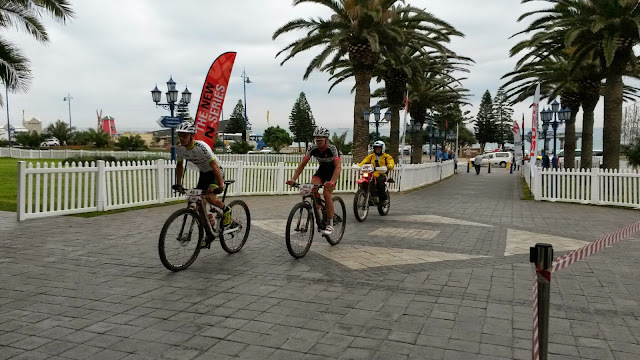 This year the second installment of the PE to Plett four day mountain bike team event between Port Elizabeth and Plettenberg Bay took place in reverse and ended at the Boardwalk on the PE beachfront. The first team arrived at the Boardwalk at about 9:45ish with the last teams struggling in somewhere between 1 and 2pm. Red Cherry Adventures does an fantastic job organizing this event and I'm sure it will soon start to rival the Cape Epic as one of the top mountain bike team events in South Africa. The Damselfly has no interest in rugby and in a lesser degree neither has Chaos Boy. Drama Princess on the other hand just loves it and would go to the Nelson Mandela Bay Stadium for every Kings game if she could. After missing the last few while out of town, Friday night's Kings vs Bulls game came around and I had to take her to make up for missing the others. Geocaching takes one to weird and wonderful places. In this case weird. 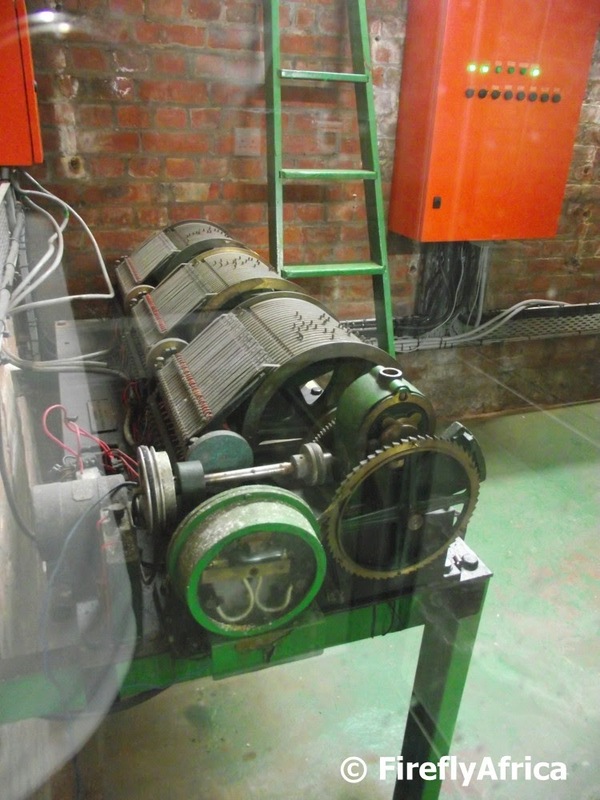 George and Jill of George c12 went after a cache located within a storm water pipe in the western suburbs somewhere. I don't quite want to give it away to muggles but the pipe goes quite far under the intersection and you have to walk a good 20 or 30 meters into it before you find the cache. That is all I'm saying. 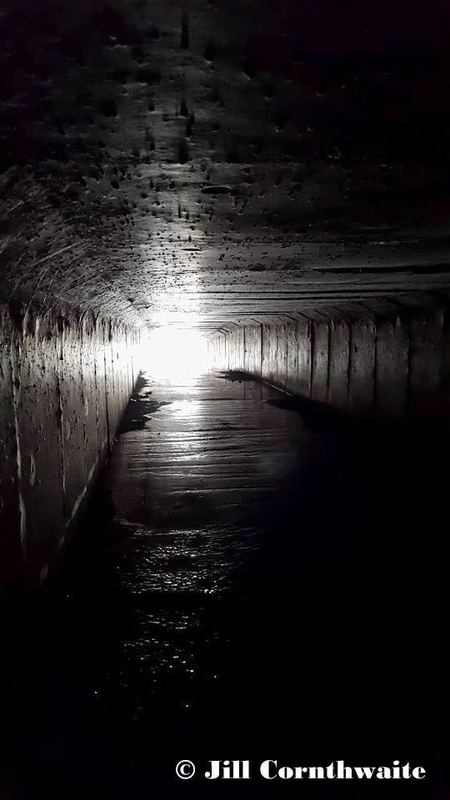 Jill snapped this picture looking back towards the entrance of the pipe. Some know it as the Settlers Freeway and some just call it by its number, the M4 freeway. 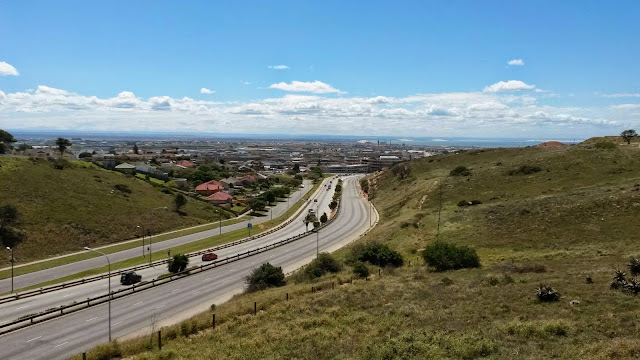 But whatever whoever calls it, this is what the freeway cutting between the city and Algoa Bay looks like from the top of the Campanile. Tamara recently came across a video posted on YouYube by Glenn Fuller. Its a fun video by his daughter Derryn and her UPE/NMMU student group who did it as a project back in 2006 with Jannie and Baksteen and their legendary "Living in P.E." song! As Tamara said. It made me smile (and is quite catchy) and that is why I decided to share it as the Friday video for this week. A couple of nights ago I attended the Eastern Cape provincial Lilizela Tourism Awards at the Feather Market Centre. 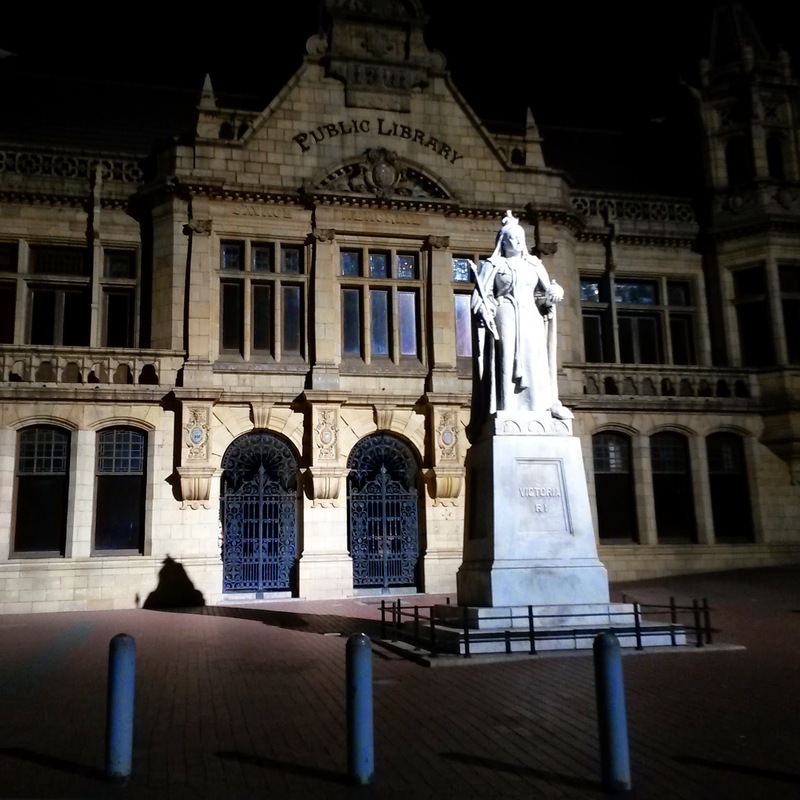 Most of us parked on Market Square and on my way back to the car somewhere between 11 and midnight I snapped this picture of the historic Public Library with Queen Vic in the spotlight. 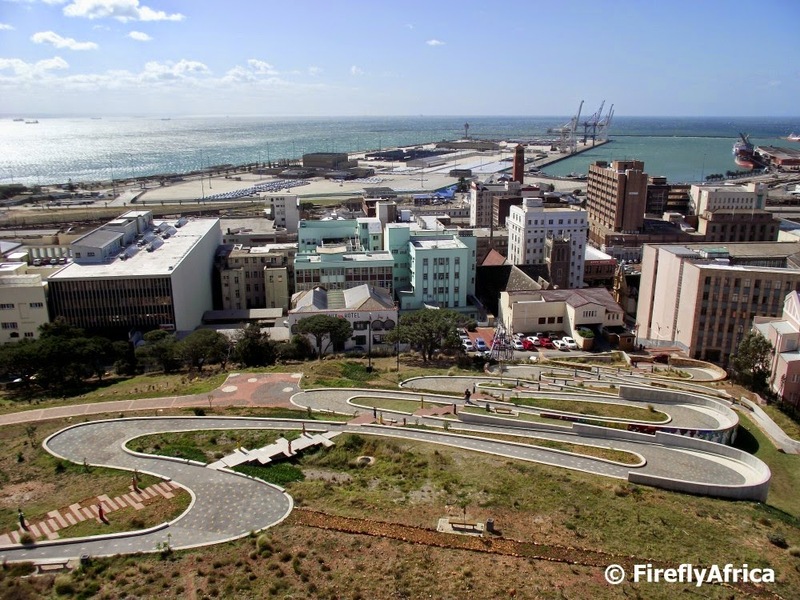 I'm always amazed at how many people didn't know that Port Elizabeth had involvement in the Anglo Boer War even though the war didn't take place here. 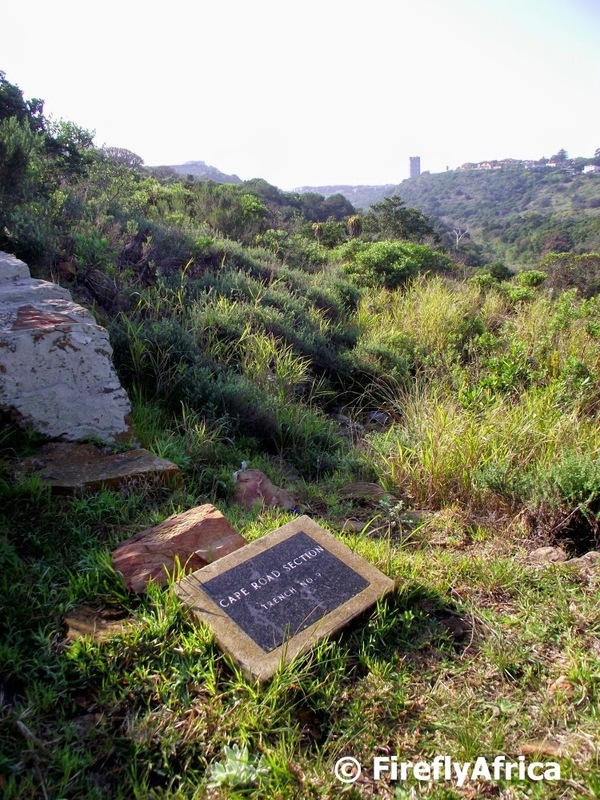 Even less people know that there are old Boer War trenches above the Baakens Valley in Settlers Park where the town guard set up lookout spots on the approach to town. They can be reached from the How Avenue parking area and via a short walk. 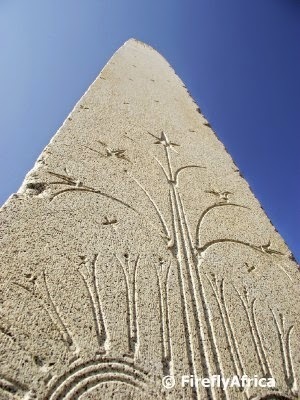 I often wonder how many people have noticed the stone obelisk outside Bayworld in Humewood. 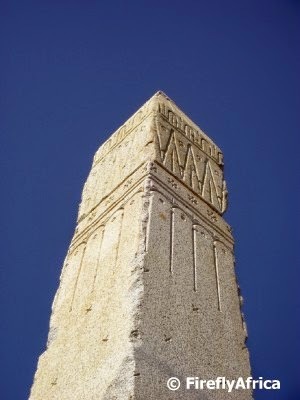 The obelisk is called The Prince of Wales Obelisk and was brought to South Africa by the founder of the Eastern Province Herald, John Paterson. It was meant to be placed on the grave of his partner, George Kemp but the Kemp family thought it to be slightly too much and donated it to the city. 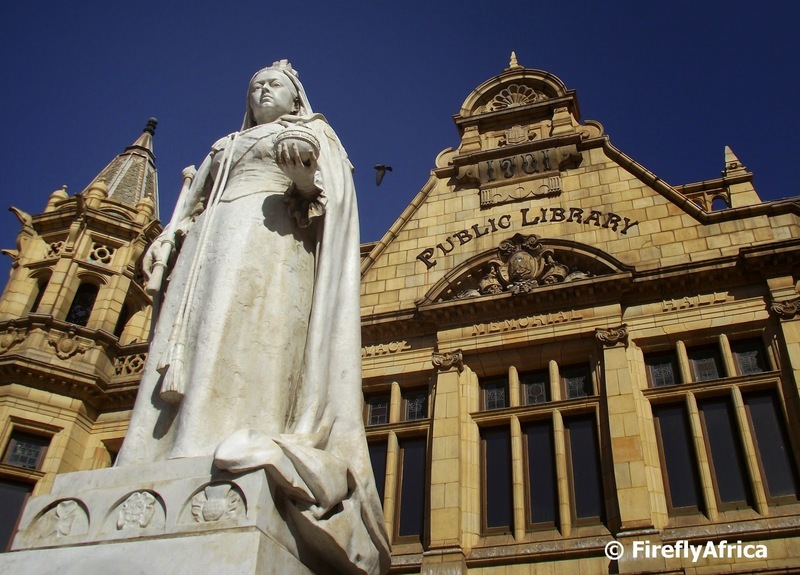 The City decided to erect it in front of City Hall on Market Square to commemorate the Prince of Wales’ marriage to Princess Alexandra which was done on 22 May 1863. 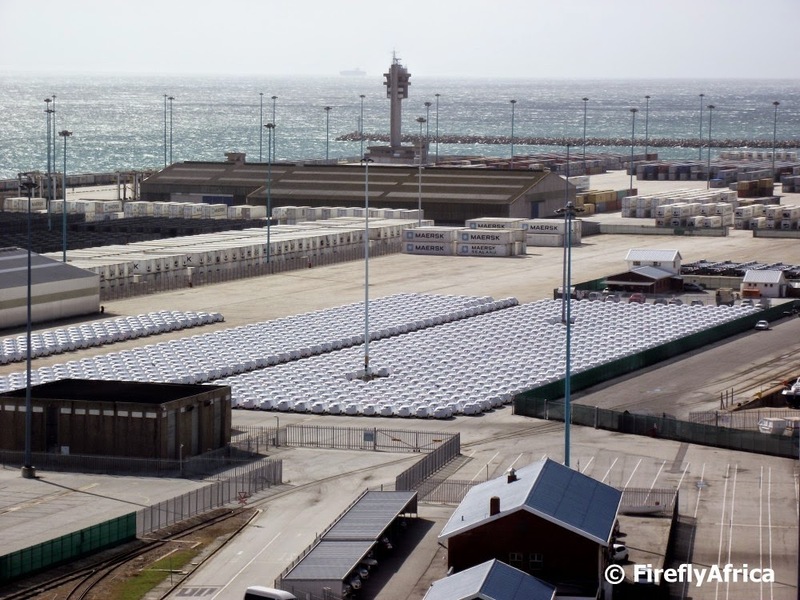 Four water troughs were added in 1877/8 and were filled with water during a “tap ceremony” when water was first piped to Port Elizabeth. 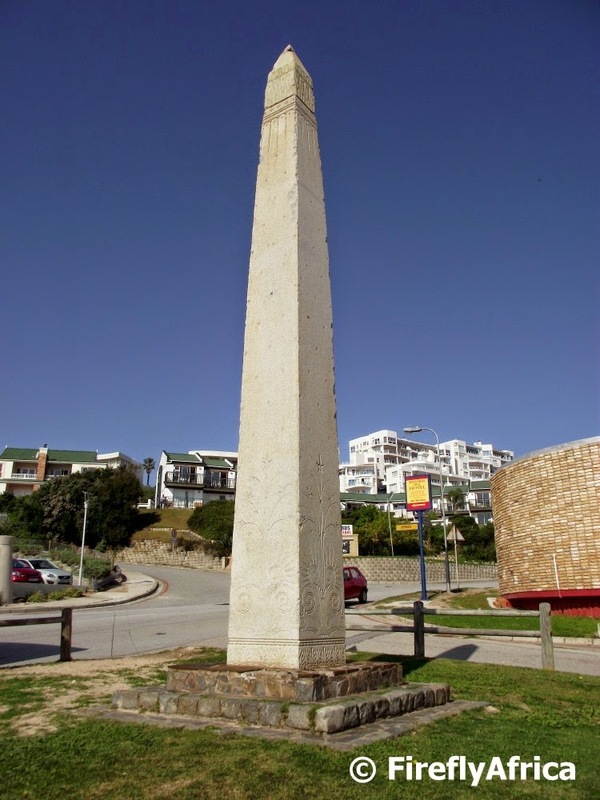 The obelisk was removed in 1921 and stored until 1975 when it was erected outside the Port Elizabeth Museum (Bayworld). 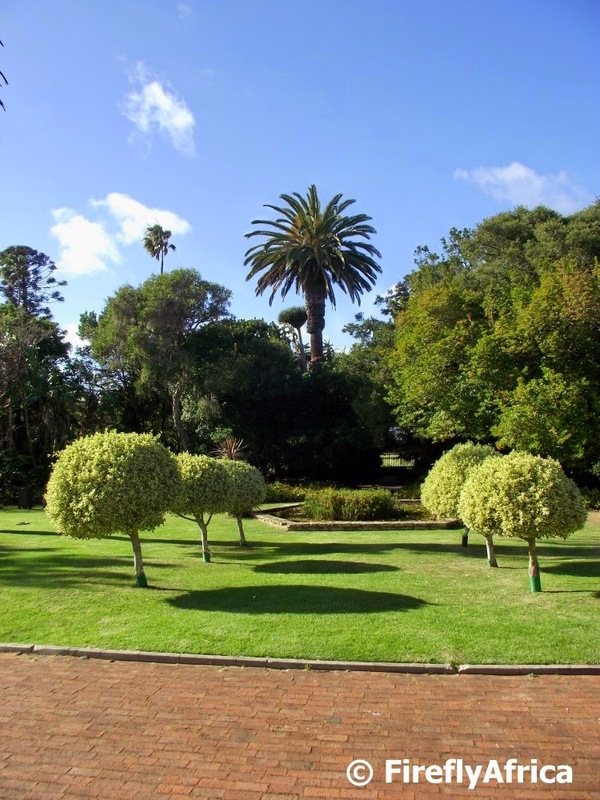 One of the original water troughs was placed on the lawn at the Walmer Town Hall but the location of the other three troughs is unknown. Climbing the 204 steps to the top of the Campanile one would think that you would be in one of the highest spots in the city centre (this is no chirp at the fact that PE doesn't have a lot of high rise buildings), but once you are up there you realise that the Donkin Lighthouse up on the Donkin Reserve is actually higher. Its a lighthouse who's light was supposed to be seen out to see after all. I have succulents like these in my rock garden but it was great to find this patch in Settlers Park a few week ago. They make for a nice ground cover and is beautiful with their pink flowers. Probably one of my favorite spots in St Georges Park. 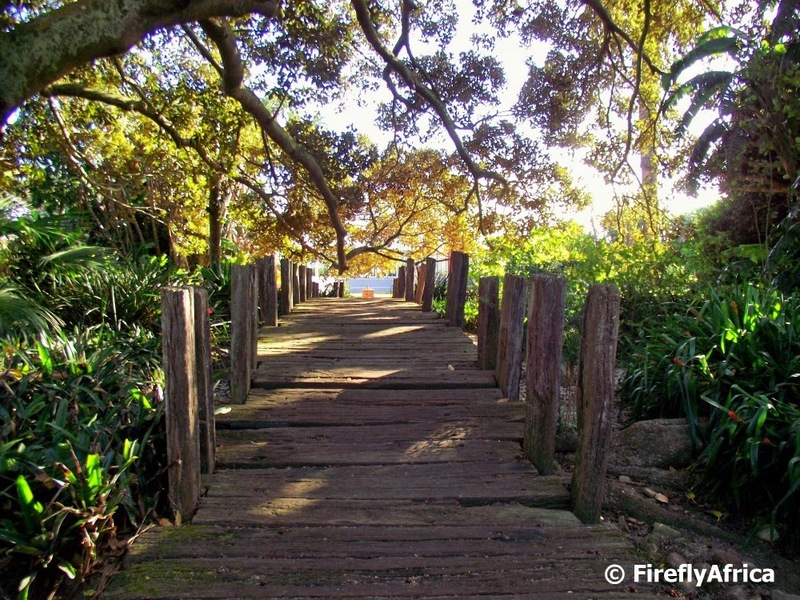 The railway sleeper bridge near the Pearson Conservatory. I should look under it one day to see if there is a troll that lives there. I was looking for a video on YouTube to post for what has become the regular Friday video feature and stumbled on this vid posted by Kings Beach Skateboarding and filmed and edited by Rieyaad Saban. It shows a couple of local skateboarders doing their thing at the skate park at Kings Beach. Standing at the top of the Campanile one tends to wonder how many have never seen the views from up here. I can understand somebody who is unable to climb for whatever reason not to go to the top, but most others who have never been there is probably to some degree just too lazy to take the 204 steps to the top. So kick those lazy bones in under the bed and be adventurous. The climb won't kill you and the view is well worth the effort. This view is looking out the south window down onto the harbor. 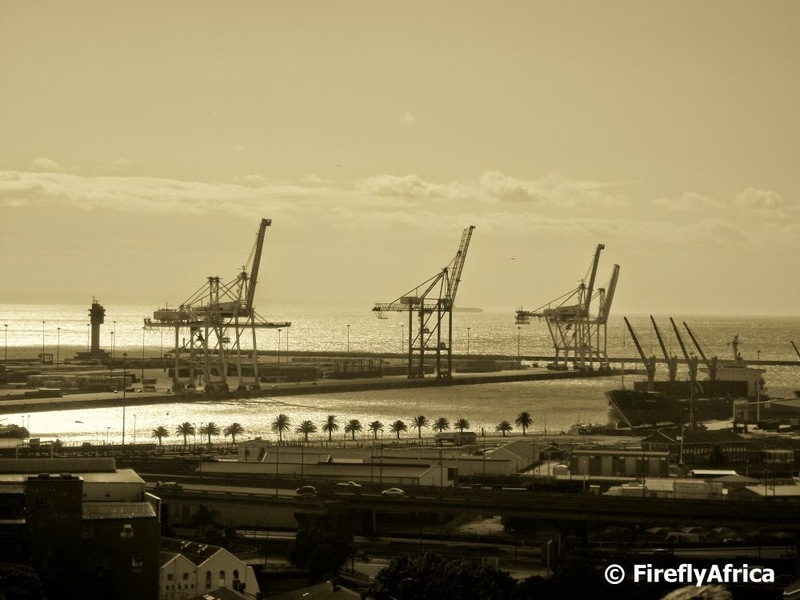 After posting a picture featuring the Port Elizabeth Harbour on Tuesday, I decided to do another one. 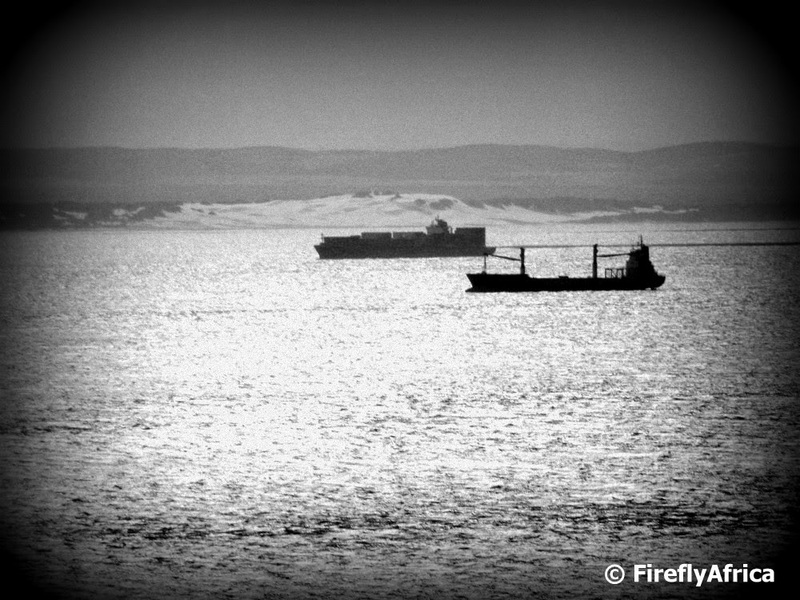 This time its an fairly empty harbor photographed from Fort Frederick and posted in sepia. I always love the "harbor giraffes". I would have asked it to fire a salvo of 39 shots for me today. 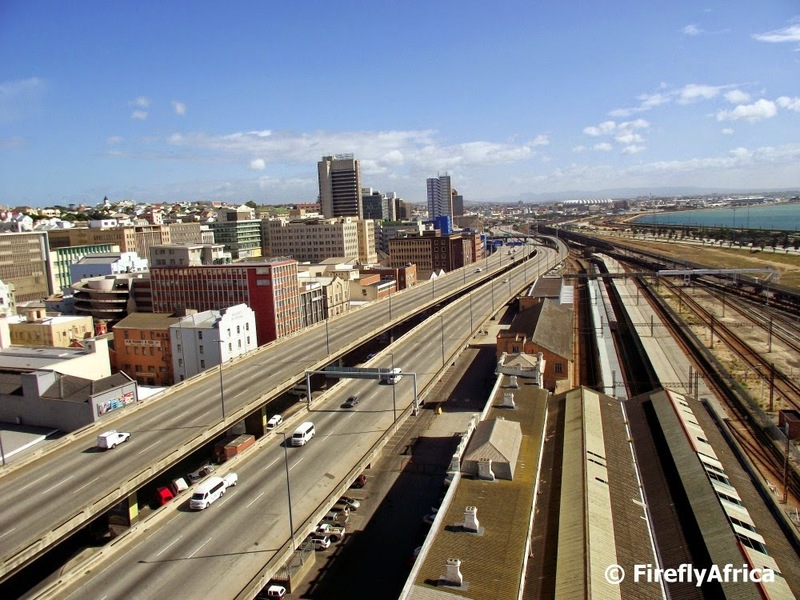 Nelson Mandela Bay is a motoring mecca with General Motors situated in Port Elizabeth and VW in Uitenhage as well as numerous other motor related factories manufacturing everything from engines and catalytic converters to bolts and rubber tubing. 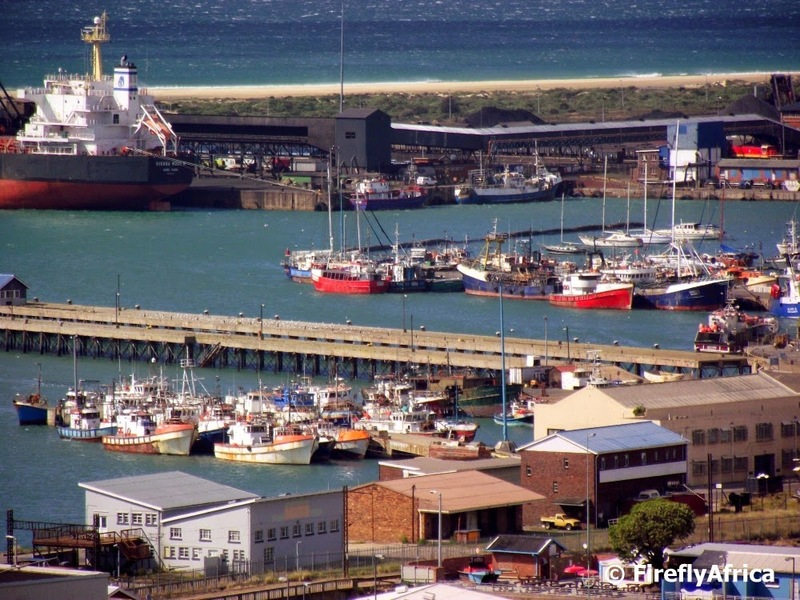 Both GM and VW export their cars through the Port Elizabeth Harbour and from the top of the Campanile you can see the cars lined up quayside waiting to be shipped abroad. Today is the 1st of September and we are celebrating Spring Day. Not that winter is over by a long shot but the season is turning and signs of spring is starting to appear all over the show. I was hoping to post some flowers in celebration of spring but unfortunately had non on hand. I'm driving back from Johannesburg after the Getaway Show and never thought of uploading a flower picture before leaving. I do have this picture of St Georges Park in front of the Pearson Conservatory for you instead.